Vinyl Digital Exclusive. Limited Edition of 350 Copies! Nur 1 Exemplar pro Kunde / only 1 copy per customer, please! 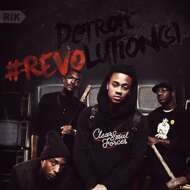 Detroit's freshest Newcomers with the incredible Debut Record produced by Kankick, Namesless, King Midas & Ilajide! Following the great Footsteps of legendary Dilla, these young cats are revolutionizing Detroit's Hip Hop Scene. Combining true school sample Beats with a modern attitude, the 4 group members achieved over 1 million YouTube Clicks for "Get No Better". Fan-Tas-Tic!!! Full Picture Cover & colored Labels.